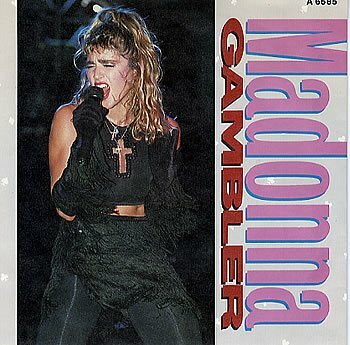 "Gambler" was a fast-paced, synth-based, dance-pop track that gave Madonna her eighth consecutive top ten hit of the 80s in the UK, reaching No.4. The energetic song was written by Madonna and produced by John "Jellybean" Benitez, but isn't regarded as one of Madge's finest moments, receiving a very mixed response from the critics. Apparently, she has only ever sung the track live on one occasion, and that was on The Virgin Tour during 1985. Despite this, I've always enjoyed this tune and like the fast tempo which has an almost punk-like quality to it. Apparently, she has only ever sung the track live on one occasion, and that was on The Virgin Tour during 1985. Despite this, I've always enjoyed this tune and like the fast tempo which has an almost punk-like quality to it. The song was Madonna's second single to be lifted from the soundtrack to the movie Vision Quest, with the first being the hit ballad Crazy For You. Other well-known artists on the album included Journey, John Waite, The Style Council, Foreigner and REO Speedwagon. Madonna also had a role as a singer in the film, and can be seen singing her two hits "Crazy For You" and "Gambler" in a local bar.